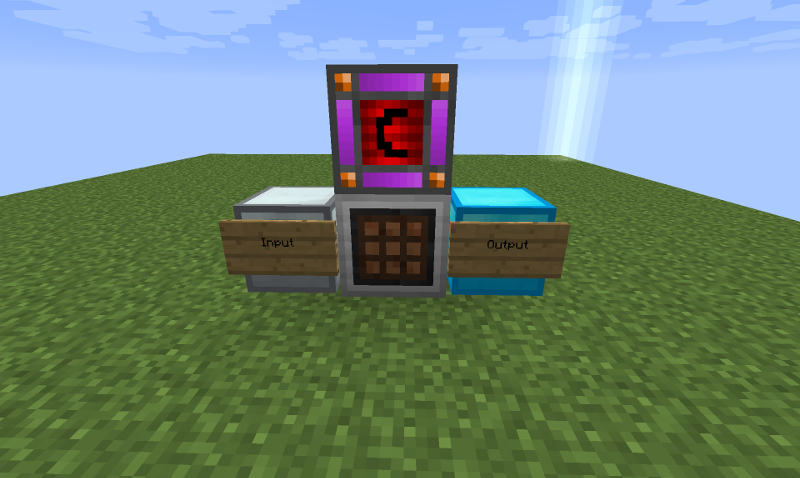 Just a simple machine that takes RF power (as of version 1.6.4, now uses Forge Energy instead) and scans an inventory to the left (when facing the front) and crafts any item of a single type that can be crafted in a 2x2 or 3x3 grid (i.e. nether quartz -> quartz blocks or iron ingots -> block of iron), placing the result in an inventory to the right. As of 1.4, if items cannot be crafted during a cycle, stacks of identical items will be merged. As of 1.5.3, a new mode has been added: 3x3 hollow. Using this mode, items will be crafted using a chest-like pattern. This can be used for furnaces, chests, and the majority of Magical Crops essence crafting. Additionally, the AutoPackager itself will act as a Sorting Connector for a Refined Relocation sorting network. This mod may be included and redistributed in any modpack, public or private, without requiring explicit permission. Simple yet magnificent. Factories AHOY! First so I don't sound ungrateful, thanks for making this mod. Now that we got that out of the way, this mod doesn't seem to work with the multipage chest mod installed. I provide an input and output chest and a source of power but nothing happens. I have provided 4 glowstone as an example for testing purposes to see if it will work. Should I have to wait 5 minutes before something is supposed to happen? 1st picture is the input chest. 2nd picture is the output chest. What's the item in the bottom center square of the recipe image? It is an older image, but it was a Redstone Reception Coil from Thermal Expansion. It is now just vanilla redstone dust instead. It used to be that if TE was present, it would use the coil, otherwise just redstone. In 1.12, recipes aren't so dynamic anymore, so it's just redstone. Good job, I hate that the compactor of thermal expansion pull less than 9 items from input chest to compress and then get stucked. Your machine dont do that, i love for this. I have a sugestion, It will be nice the AutoPackager stops with redstone signal. Seems there is no way to stop now. I get this spam a lot on client and server when the AutoPackager is running https://pastebin.com/LHPEg2Yw. Using the autopackager-1.6.4.jar for Minecraft 1.10.2. It made a 7gb log file on my server since its a skyblock world with multiple of these running non stop. Debug code enabled or something? Another issue is that everywhere the AutoPackager comes up as tile.packagerBlock.name. Hwyla, JEI, they all show it as that. Possible fix? Any plans on updating to this to 1.11/1.12? When I get a chance, I will update it. I'm using this mod for the first time (sky factory 3 modpack). But it didn't seem to function as expected. Well I finally figured it out. I have a double vanilla chest placed next to this. But the autopackager only looks inside right chest (the chest placed directly against the left side of the autopackager). Not sure if this is intended or a bug. Just thought I'd drop a message. It's not really a glitch, or a bug. You just need to place Itemducts with output on the autopackager and that output needs to go to the chest, or the side of the chest that is not working. Then u need to put a redstone signal next to the output, and then auto packager realises that he is using only 1 side of the chest. Hoppefully i helped. Sorry for my english. Any reason this wouldn't be working to combine lootbags? The AutoPackager does not look at multiple slots at once (but it will try to combine stacks if nothing can be done with the inventory as it is). Unfortunately... loot bags do not stack, and therefore won't be a stack of at least 4 to try to craft with. Thanks for the answer. I ended up using an Extra Utilities Analog Crafter. I want to use the auto packager without needing power, as I'm assembling a very very light collection of mods for myself and a friend to play with. But when I set the config to use 0 RF, it still waits for power to work, even though it doesn't use any. My only option as of right now is to add some other mod that includes a power source, but unfortunately most of my options include huge game changing additions. Even if there was a simple "endless battery" block (ender io has one but I just didn't want to add such a massive mod for such a simple purpose) I really want the autopackager to be stand alone.... Is there a way to change the block so the when the rf requirement is set to 0, it works without needing a power source? I can make a simple change to the code to make sure that it does work even with the required power set to 0, but you will still need to have a mod that provides the RF API. You apparently already have some mod that provides it since you would crash when placing an AutoPackager otherwise. auto compressors do not seem to need rf... at least, it they do, a sterling generator with a stack of coal is enough for a while. Hey, when I try ender io conduits it doesn't give power nor will it craft I have 50 mill rf ready for it but still do I need certain cables? EnderIO conduits should work, unless EnderIO has removed RF support (which doesn't appear to be the case). Perhaps the input and output inventories aren't usable in some way?